The Isle of Man Pound, or Manx Pound, is the currency of the Isle of Man. Manx pound coins were first issued in 1668. 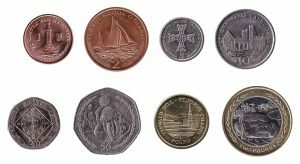 The Pound Sterling and Manx Pound are two different currencies, but they are interchangeable with each other on the Isle of Man. Manx Pounds are not legal tender in the United Kingdom. We exchange Manx Pound coins and banknotes, and we also accept withdrawn Manx Pound banknotes. Our online exchange service is quick, easy, secure and free of charge.